I first saw Francois Truffaut’s film Shoot the Piano Player sometime in the mid 70s, when channel 11 out of Chicago used to play classic foreign films from the Janus film library in the afternoons. It was right at the time I was becoming a serious film buff and started buying books and encyclopedias on movie history. It was lucky coincidence that Channel 11 was airing many of the greatest films of all time at the same time I was reading about them. I remember seeing Fellini’s La Strada, De Sica’s Bicycle Thieves and Shoeshine and Umberto D, Bergman’s The Seventh Seal and Wild Strawberries, and Truffaut’s The 400 Blows and Jules and Jim. I also began studying the classic American directors, John Ford (How Green Was My Valley and The Grapes of Wrath), Orson Welles (Citizen Kane and The Magnificent Ambersons) and John Huston (The Maltese Falcon), among others. As great as many of the American films were, there was something different about Fellini, Bergman and Truffaut. It was their sensibility, their willingness to take chances, the unusual subject matter and characters. For example, I immediately fell in love with La Strada, though it wouldn’t be until after several viewings that I got a sense for what was really going on. I knew the three main characters were symbols for something; exactly what, I had no idea. What I was falling for was the pure sensory beauty of the film, the poetry of the images. It was, in visual terms, what William Faulkner and Flannery O’Connor were doing to me with language. ﻿﻿So it was right in the middle of the most passionate time of my love affair with movies that I first saw Shoot the Piano Player. It was radically different from Fellini or Bergman, and I recognized the American gangster movies of the 30s and 40s it seemed to be paying homage to. It was goofy and eccentric, with low brow slapstick and sight gags and stupid humor. But as it went on, a remarkably sophisticated and deceptively complex story was being told, a story that immediately drew me in, and it connected with me on a level that no other film ever has. Unlike La Strada and The Seventh Seal, I got it right away. And I wasn’t the only one. Through the years, films like Bonnie and Clyde and Pulp Fiction would transform the American gangster genre, and it was obvious that directors Arthur Penn and Quentin Tarantino had also seen and been affected by Shoot the Piano Player. More on that later. Shoot the Piano Player is about Charlie (wonderfully played by Charles Aznavour), who we find at the beginning of the film playing piano with a jazz trio in a cheap Parisian bar. He lives in a small apartment above the bar with his still school-age younger brother. In the apartment across from his lives a prostitute who, when not doing business at the bar, helps Charlie out, by baby-sitting his brother and seeing to other needs he might have. Early on we are introduced to another of Charlie’s brothers, an inept, bungling, crude oaf of a gangster, who is being chased by a couple of other comically inept but dangerous gangsters. We also learn, early on, that Charlie is secretly in love with the beautiful bar maid Lena (Marie Dubois), but is too painfully shy to act, to make his feelings known. Charlie and Lena inadvertently get drawn into the gangster story and are captured by and then escape from the gangsters that are after Charlie’s brother. They flee to Lena’s apartment. This is where the story really gets interesting. Without revealing too much of the plot, Lena knows something about Charlie that no one else knows. Via flashback, we are told the tragic story of Charlie's past. The flashback story is fascinating in itself, and is vital for understanding who Charlie is and who he was, how the past informs the present, and why Charlie seems to be so ineffective at everything except playing the piano. 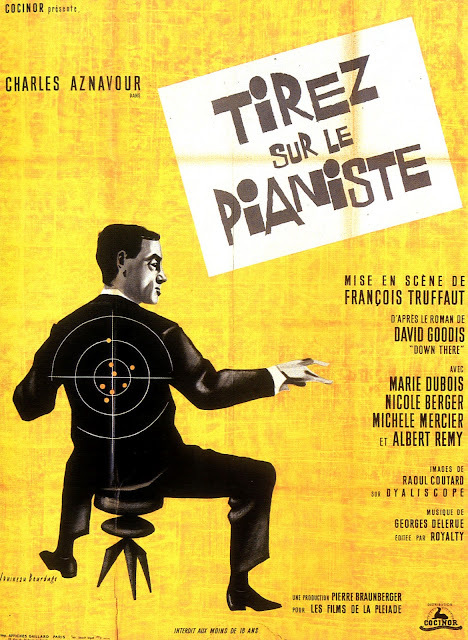 Shoot the Piano Player is actually very short and shot on a shoe string budget, but there is so much going on, and Truffaut moves it about so quickly, packing so much information in each frame while at the same time experimenting with different point of view camera shots and throwing in his cheap sight gags. In the meantime, while we are being entertained, on a more subtle level we watch Charlie struggle with questions of identity, while Truffaut explores complex themes related to life versus art. Charlie is born with a gift for art that he didn’t ask for, and he has no idea how to live. Much is made of his shyness and timid nature; he drifts through life, uninvolved, while those around him, those moved by his artistic gift, suffer for it, and he bounces from one tragedy to another, always finding a piano somewhere to play. The film has at its core a tragic melancholy, yet it is vibrant and alive and fun the whole time – it’s how well Truffaut makes this contradiction and dichotomy work that makes it so radical and remarkable. The film exists in a world of its own making, and although it draws on many of the American film noir movies of the 30s and 40s, it has a timeless quality to it. This is due in large part to the soundtrack, scored by the great Georges Delerue. The music is gentle but powerful and evocative. I mentioned Bonnie and Clyde and Pulp Fiction, two landmarks of American cinema. Both films are known for their groundbreaking and graphic use of violence, and you won’t find anything of that sort in Shoot the Piano Player. What you will find is the same contradiction at work, the same sensibility in the treatment of the criminals. In Bonnie and Clyde, Faye Dunaway, Warren Beatty and their gang are portrayed as simple and comic everyday people. We laugh at them and with them, and we see ourselves in them. The way Arthur Penn establishes this is through the same kind of dumb jokes and friendships that Truffaut used to make his characters so likeable. In Pulp Fiction, in the dialogue between John Travolta and Samuel L. Jackson, and in the interaction of the various pimps and drug dealers and gangster types, Tarantino takes this approach to a new level, making us identify and care about these unsavory types. In both Bonnie and Clyde and Pulp Fiction, the violence is graphic, and it is jarring because of our identification with both its victims and practitioners. Though both films are unique and bold statements that stand on their own, they both owe a debt of gratitude to Truffaut. Truffaut was one of the great originals of all cinema, and is one of my two or three favorite directors of all time. The thing that I think sets Truffaut apart from other directors and runs through all of his films is his respect for basic humanity. Even when exploring the darkest of subject matters, Truffaut maintained his romanticism and found the light in the darkness of the stories he told, whether it was the unabashed love of the three main characters in Jules and Jim, the attempt to preserve humanity in Fahrenheit 451 or find it in The Wild Child, or the hanging on of a romantic ideal against all reason and logic in The Story of Adele H. It is the value Truffaut places on this humanity, the belief that it is core to being human, that has resonated with me through all these years, and has been evident in the other artists I’ve admired, from Kurt Vonnegut to John Steinbeck to Bob Dylan to Bruce Springsteen. In these dark and cynical times of the early 21st century, it's a shame Truffaut is no longer with us, but his body of work endures and is more relevant and important than ever.